Emergencies affect every community differently, but you can help your community be prepared and resilient. NYC Emergency Management helps local organizations build capacity within their community to prepare for, respond to, and recover from an emergency. This includes training classes and events, preparedness and emergency information, preparedness resources for disability, access and functional needs populations, and connecting established community networks to the City's Emergency Operations Center during a disaster. You can also become a volunteer. Help your community become more resilient! Learn about how New York City plans for hazards and how your organization can help your community create its own emergency plan. Get a copy of the toolkit to start making your community's emergency plan today. Use the plan template to capture and organize the ideas and decisions made during the planning process. The Community Preparedness program offers a Community Preparedness Boot Camp. 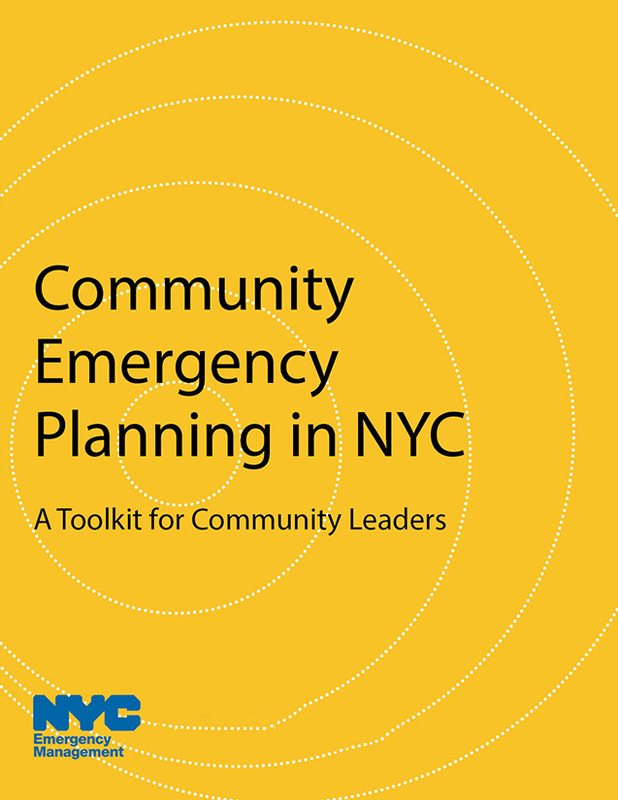 The training uses the Community Emergency Planning Toolkit to assist local organizations with emergency planning, and connects them with NYC Emergency Management's resources. Learn how to develop an emergency plan and make your community more resilient. Deepen existing knowledge about your community and government emergency planning and response. Understand your community’s vulnerability to emergency situations and create resource directories. Provide opportunities to make new connections and start building your own community network. Create a communication plan, and learn how to connect your neighborhood to community and government resources during an emergency. Integrate community organizations and faith groups into government planning and response. Contact the program if your organization is interested in participating in the next Community Preparedness Boot Camp. Community emergency networks help local communities share information during all phases of emergencies. They also help identify community needs and gaps in services and offer a structure for community based emergency planning. Through communication, partnerships and education, these networks can be a powerful resource in your community. NYC Emergency Management’s Community Preparedness and Response Portal provides an online platform for community-based organizations and faith-based groups to build networks with other groups active in emergency planning and response. The portal also offers a mapping tool and a variety of planning and response resources. The Share Your Space Survey is critical to helping the City prepare for emergencies and outreach to all of the City's communities. Organizations citywide are encouraged to participate. Learn how New York City plans for specific hazards and what community leaders can do to mitigate impacts of emergencies.